Historically, texture was a term used to describe the workability of an agricultural soil. A heavy, clay soil required more effort (horsepower) to till than a lighter, sandy loam (Russell, 1973). A more quantifiable approach is to characterize soils in terms of the sand, silt, and clay pre sent, which are ranged on a spectrum of light-intermediate-heavy or sandy-silt-clay. The array of textural classes (Fig. 1.7) shows percentages of sand, silt, and clay, and the resulting soil types such as sandy, loamy, or clayey soils. The origin and mineralogical composition of mineral particles in soil is a most interesting and complex one. 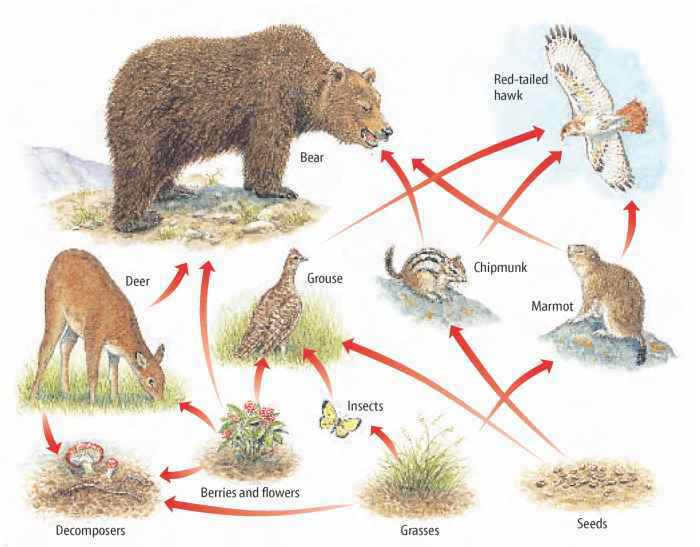 The particles are in two major categories: (1) crystalline minerals derived from primary rock, and (2) those derived from weathering animal and plant residues. The micro-crystalline forms are comprised of calcium carbonate, iron or aluminum oxides, or silica. FIGURE 1.7. Diagram by means of which the textural name of a soil may be determined from a mechanical analysis. 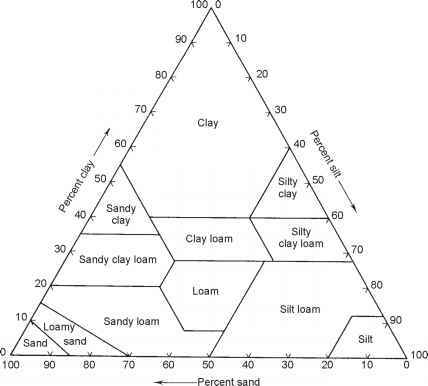 In using the diagram, the points corresponding to the percentages of silt and clay present in the soil under consideration are located on the silt and clay lines respectively. Lines are then projected inward, parallel in the first case to the clay side of the triangle and in the second case parallel to the sand side. The name of the compartment in which the two lines intersect is the class name of the soil in question (modified from Buckman and Brady, 1980). The clay fraction, so important in imparting specific physical properties to soils, to microbial life, and to plant activity via nutrient availability, is comprised of particles less than 2 micrometers (|im) in diameter. Unlike the sand-silt minerals, clays are weathered forms of primary minerals, and hence they are referred to as secondary minerals. Coarse clay particles (0.5 |im) often are derived from quartz and mica; finer clays (0.1 |im) are clay minerals or weathered products of these (such as hydrated ferric, aluminum, titanium, and manganese oxides). No matter what size the particle is, microorganisms in unsaturated soil exist in a world dominated by the presence of extensive surfaces. There seems to be a general advantage to microbes living at these interfaces in terms of enhanced nutrient concentrations and the potential to use many of the physical substrates themselves as energy or nutrient sources. The thickness of water films in unsaturated conditions allows the microbes little option except to adhere to the surfaces (Mills, 2003). We discuss some of the microbial dynamics and interactions with soil organic matter in Chapter 3. The roles of coarse and fine clays in organic matter dynamics are under intensive scrutiny in several laboratories around the world (Oades and Waters, 1991; Six et al., 1999). It is possible that labile (i.e., easily metabolized) constituents of organic matter are preferentially adsorbed onto fine clay particles and may be a significant source of energy for the soil microbes (Anderson and Coleman, 1985). For more information on the environmental attributes of clays, see Hillel (1998).